A couple of months ago I wrote about the Eve mattress. I was singing its praises but how do I feel about it today? Is it still all its cracked up to be? The short answer to this is hell yes! In fact it has got even better! How? With the addition of the Eve bed. As beautiful as my bed was it had seen better days. 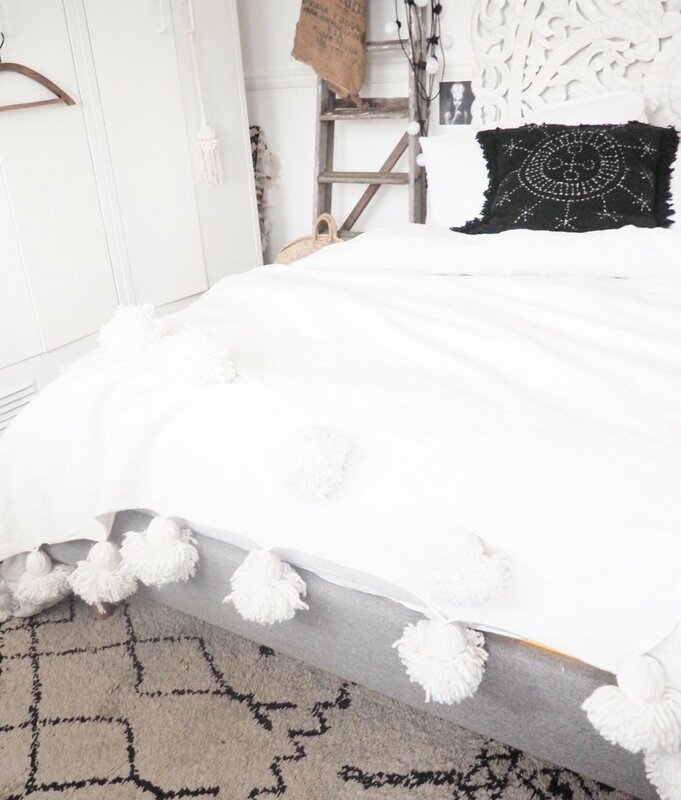 I had spotted a pretty amazing headboard on Maisons du monde and decided to get the headboard even if it meant putting up with sleeping on a mattress on the floor for a while which I did and to be honest it was super comfy but a little low. So when Eve contacted me to try out their new bed frames I was totally up for that! I picked the one without a headboard and soon enough the bed arrived! What I love about Eve is it's not just pretty design it is clever design! A lot of thought has been put into the simple way the bed slots together, the way the slats come as one full sets, the way you only need one tool to put it altogether and that tool is there in its own little pocket and as an integral part of the design. Tea break included it took me around half an hour to put together and I am completely rubbish with practical things! The frame feels strong and sturdy and again oozes quality. With its ash tapered legs and grey Italian wool upholstery it's a classic design that would sit happily in most interiors. I love it and I recommend it without hesitation. And yes this is a sponsored post and I was gifted the bed but you know the drill I never write about anything unless I love it and I think you would too! The design, the build quality, the customer service. Eve is a breath of fresh air in the bed industry and long may it continue! The bed is also available with headboard if you don't already have one. Disclaimer: For the purpose of this review I was very kindly provided with an Eve Bed of my choice. All opinions are of course my own.